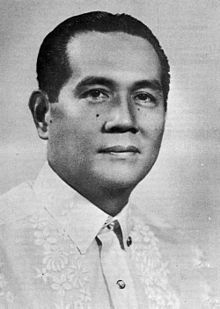 Diosdado Pangan Macapagal was the ninth President of the Philippines. He is known for changing the country's Independence Day from July 4 to June 12. June 12 is the day President Emilio Aguinaldo declared independence of the First Philippine Republic from the Spanish Empire in 1898. He is the father of Gloria Macapagal-Arroyo, who was the fourteenth President of the Philippines from 2001 to 2010. ↑ "Today in Philippine History September 28, 1910, Diosdado P. Macapagal was born in Lubao, Pampanga". 28 September 2011. Retrieved 21 September 2016. This page was last changed on 22 April 2019, at 15:02.